Grandma’s Garden – Romantic Vintage Style Real Flower Jewelry. Statement hand forged copper necklace with real oregano flower. 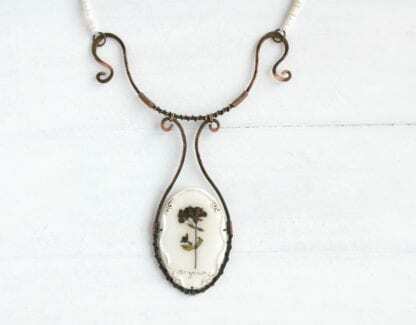 Grandma’s Garden Jewelry handcrafted of real plants only. I grow the main part of flowers in my garden and prepare herbarium by myself. All flowers keep natural unusual color. Plants are covered with a durable crystal clear top layer. The coating stays clear during the whole time and protects natural flowers very reliable. Hand forged and hand painted with a patina process copper. The copper details have stylish rustic texture. Surface is quality polished . You can clean flower frames by using wet wipes and immediately after this dry wipes or soft fabric. Better store jewelry in the boxes or away from direct sunlight.